Last week, we were all thrilled by FHM’s Bikini Heaven. We’re still on a high, and we plan to keep it that way, so here’s where you can keep the good vibes coming this weekend. Over at Saguijo, you can check out some great rock acts on March 25, as Kerplunk! and Pop-No-Comply Present Subscapular "We Are Kids Forever" Album Launch with Carlos Castano, Enemies of Saturn, Imbuenokudos, Intolerant, Jejaview, Six the Northstar (A.M.P.O.N./MDK), and Vincent Trazo (Gasulina). On the next night, it’s going to be just as rocking with Princess Batugan headlining the night. Over at Quezon City on March 25, it’s The Jerks giving you your weekly dose of good ol’ rock at 70s Bistro, while Kalayo takes over the stage, the next night, March 26. Penguin Bar also promises a chill night as they host Chilitees on March 25, and the smooth reggae grooves of Reggae Mistress and Gudleaf on the 26th. Got a love for dogs? Then why don’t you bring your pet to the Pet Express Doggie Run on March 26, 5:30 a.m. at SM Mall of Asia, Pasay City. You can choose from the 1.5K, 3K, and 5K race events with registration fees set at P350 (complete race kit) and P300 (no dog bandana/dog race bib). Part of the proceeds will go to the Strike Animal Welfare Society (SAWS). You may register at any of these Pet Express branches: SM Cubao (912-5924), SM Hypermarket Makati (843-7174), and SM Mall of Asia (836-8955). On March 26, the grooviest place to be is at Time in Makati Avenue where you can catch Groove Nation's Deep Fried event featuring Toti Dalmacion, Cyril Yarisantos, Ali Nepomuceno, and Pav Parrotte & Martin Lugtu. Good vibes all around, and awesome music to boot. 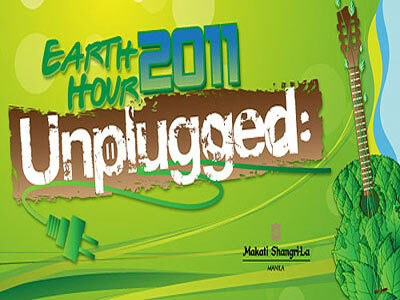 Earth Hour 2011 happens this weekend and one of the best places to spend this momentous moment in will be at Makati Shangrila. On March 26, the hotel will stage a special acoustic performance at the Lobby Lounge featuring balladeer Jimmy Bondoc and the MSE 60-piece Rondalla Troupe. If you’re not going however, then why don’t you join in on the Earth Hour by turning off your lights and other electronic devices during Earth Hour on March 26, 8:30 to 9:30 p.m.
You can also join the festivities at For inquiries, call 813-8888. Check out furniture inspired by Mars Ravelo's Comics at RAVELOcity where there will be a showcase of different furniture pieces that are inspired by one of the most creative minds that our country has produced, Mars Ravelo. His masterpieces like Darna, Dyesebel, Captain Barbell, Valentina, and the like shall be presented and translated in ways that ordinary telenovelas could only dream of, and shall be portrayed through the six (6) creative chair prototypes by the students of BS Interior Design from PUP-CAFA. From March 19 to April 2, 2011, the exhibit will be ongoing at the 3rd Floor Activity Center of SM City Marikina in Marikina City.